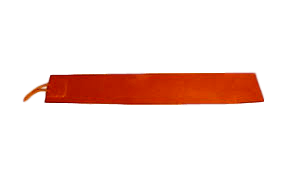 Flexible Heaters, Silicon Rubber Heaters, Drum Heaters, Kapton Heaters, Neoprene Heaters Flexible heaters from Hampton Controls are just what the name implies; thin, bendable and shaped to fit your equipment. You can use your imagination to apply heat to the most complex shapes geometries conceivable without sacrificing efficiency or dependability. Silicon Rubber Heaters offer a very high watt density while maintaining flexibility. Good for heating drums, de-icing vending machines, atms, aircraft, cars, and maintaining a comfortable temperature in medical equipment, such as CAT scanners. Hampton Controls Heater flexible heaters provide outstanding performance in applications up to 450°F. Silicon Rubber Heaters has a high dielectric strength, is non-toxic, and flame retardant. Hampton Controls Silicon Rubber Heaters with wire-wound elements provide an excellent source for uniform heat especially on challenging shapes or applications with flexing or vibration. ​The wire wound element consists of high temperature resistance wire wound around a fiberglass core for added support and flexibility while still allowing for expansion and contraction during heat up and cool down. 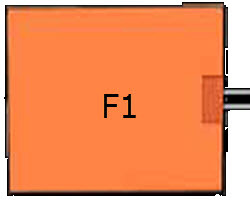 ​​The element is laid out in a computer designed pattern to provide maximum heat transfer and temperature uniformity. After the element is laid out, it is vulcanized between two sheets of silicon rubber until they become one. The silicon rubber sheets also have a layer of fiberglass for added strength and tear resistance. The same vulcanization process is used to attach the power leads and cord sets to the heater winding. Maximum recommended watt density for standard wire wound Silicon Rubber Heaters is 5 watts/sq. in. Please note that higher watt densities are only recommended for very specific conditions. Please consult the chart below to determine the maximum watt density for your application. Using lower than recommended watt densities will result in increased heater life. For grounding purposes a second layer of insulating material and a conductive grid can be added to the heater. The heater comes with a ground wire. To improve heater efficiency, 1/16”, 1/8”, 1/4”, 3/8” or 1/2” insulation can be bonded to the outside of the heater. Closed cell silicon sponge is extremely flexible and has a Temperature range of –103 F to 450 F.
Contoured parts can also be heated with silicone rubber heaters. Enclosure heaters are used to maintain temperature in any type of electrical box. Typical applications include ATM’s, control boxes, traffic signals, utility boxes, cabinets and switch gear. Enclosure heaters are excellent for controlling humidity or moisture within an electrical box. Silicon rubber heaters are typically mounted to an aluminum plate and have an ambient sensing thermostat. The plate has a flange for easy mounting to the tool. Minimum heater widths with a thermostat is 2”. Lengths are available to 40”. Aluminum plates are ½” wider than the heater. See stock page. Hampton's Heater flexible heaters provide outstanding performance in applications up to 450°F under a variety of operating conditions. Properly applied silicon rubber heater life routinely exceeds 10 years. Silicon rubber has a high dielectric strength and is flame retardant and non-toxic. Design versatility permits special heat profiles allowing zones of higher or lower heat concentration as needed. Their flexible construction makes them very easy to install on a variety of surfaces. Silicon Rubber Heaters can be mounted to flat or curved surfaces. They are not affected by vibration, flexing or repeated mechanical shock. Standard watt density– 5 watts/sq. in. All come with 48” Teflon leads. Hampton Controls Flexible Heaters come standard with 10” of 22 ga. Teflon leads. Other gauge leads available upon request. The leads are soldered at the lap connection then covered with a vulcanized lead cap. Lead caps can be placed anywhere on the heater. They can also be extended from the heater in order to allow for a more even heat distribution. Extended lead caps are often used to cure composites when tight temperature tolerances are needed. 1.5” x 1.5” cold section is required. Hampton silicon rubber heaters are available with a variety of lead wires and terminations. Silicon rubber leads are rated to 150 °C and bond well to the silicone and are extremely moisture resistant. They are not very abrasion resistant. There are several options for installation or mounting Silicon Rubber Heaters. Pressure Sensitive Adhesive An easy mounting method is to peel and stick. PSA is attached directly to one side of the heater. Just peel away the protective liner and attach the heater to the desired tool. PSA is rated to a continuous temperature of 300 F and a maximum intermittent temperature of 400 F. It is not recommended for curved surfaces. The heater should be installed within 6 months of manufacture. Factory Vulcanizing Another method of installation is to send your tool to the Hampton Controls Heaters factory. The tool is placed in a vacuum table and the SRH is vulcanized directly to the tool. This is the strongest bond available. Field Applied Adhesive SRH may also be attached with field applied adhesive. Hampton Controls Heaters will supply the required RTV to adhere the heater to the desired surface. We offer a room temperature curing adhesive. Apply a thin film of RTV on the entire bottom of the heater. After positioning the heater on the part, use a roller to remove all air trapped between the heater and the part. The RTV should be allowed to cure for 24 hours. Pressure Sensitive Adhesive, also called PSA, is the simplest mounting method. Just peel the protective paper from the back of the heater and stick it to your surface. PSA is rated to a continuous temperature of 300°F and intermittent usage up to 400°F. PSA is only recommended for flat surfaces and should be used within 6 months of manufacture. Field applied adhesive is more difficult to apply than PSA, but if done properly produces a superior bond. Hampton Controls can supply a room temperature curing RTV rated to 400°F. After applying a thin film between the heater and the surface, a roller should used to remove all air bubbles, then allowed to cure for 24 hours. Boot hooks and lace is the most common mechanical mount. Boot hooks are usually positioned 1.25” - 2” apart along the length of the heater. High temperature lace rated to 1000 F locks the heater in place similar to lacing a boot. Each end of the spring is attached to a grommet, securing the heater to the tool. Grommets are spaced approximately 2” apart. High temperature rubber rings rated to 300° F.
1” wide Velcro straps secure the heater to the tool. Hampton Controls Silicon Rubber heaters can accommodate pre-set or adjustable thermostats, thermal cut-offs, and Type J thermocouples . The most common type of temperature controls are pre-set thermostats. Each has a specific temperature range and maximum amperage capability. Please contact the factory for availability. The most common type of temperature control are pre-set thermostats. They can be mounted to sense the temperature of the surrounding atmosphere or to sense the part temperature. 10 amps maximum at 240 volts. 14 amps maximum at 120 volts. 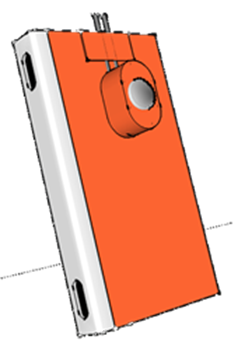 Surface sensing thermostats are mounted to monitor the temperature of the part that the heater is attached to. They can be mounted to stock heaters. Hampton Controls has several stock setting available and if other temperature setting are required, thermostats can be special ordered. Air sensing thermostats are mounted to sense the temperature of the ambient air. They are commonly used with enclosure heaters when the air temperature is more important than the heater temperature. 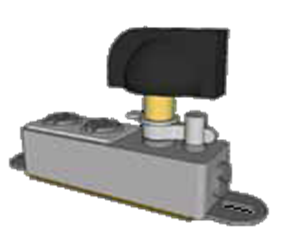 Air sensing thermostats can be added to stock enclosure heaters and standard stock heaters. They are available in the same temperature ratings as the surface sensing thermostats..
Adjustable thermostats can only be used to sense part temperature. They are often used with drum heaters but can also be used with standard heaters. Temperature adjustment range is 25°F to 330°F. Thermocouples can be mounted to any silicon rubber heater and any calibration (J, K, etc.) is available. Thermocouples are small and are easily embedded anywhere on the heater. Almost any type of Thermocouple can be used. Type J is the most common. Hampton's drum Heaters are an easy way to heat up drum contents. Various sizes and lengths allow you to heat up practically any drum, pail or barrel. Uniform heat prevents scorching or degradation of the contents. The silicon rubber band heater is placed below the level of the fluid. The easy spring lock-up provides movement of the band when content levels fluctuate. The band style drum heater can be used on plastic, alloy or just about any material. Easy installation with spring loaded fastener. All heaters come with 6 ft. SJO cord set and easy spring loaded fastener. See our Large Supply by Clicking on the Stock List Tab above or Configure your Silicon Rubber Heaters here.